It means refusing to take a standardized test such as MCAS. Why should I opt my student out? To protect your child: For many students, the Big Test can be very stressful. 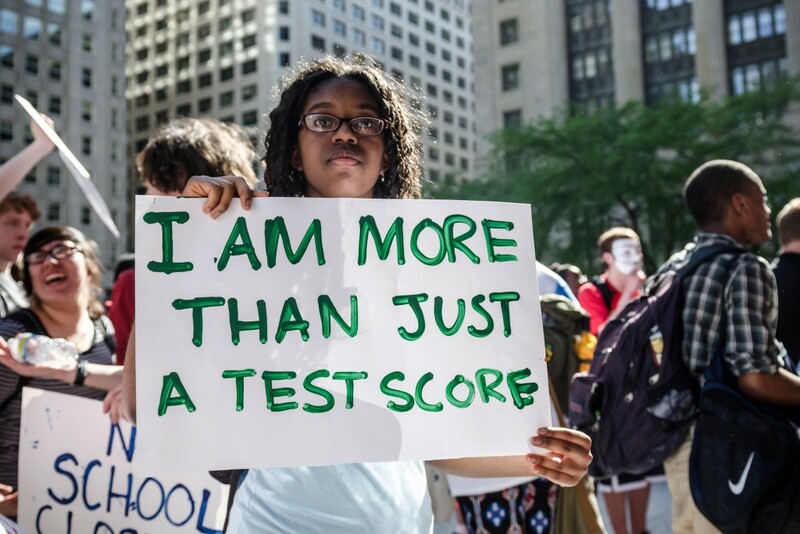 To improve education for all students: Opting out is an effective way to protest the overuse and misuse of standardized tests, which forces schools to focus on the demands of the tests instead of the needs of students. Test obsession eats up classroom time, narrows curriculum, destroys children’s love of learning, and fuels the school-to-prison pipeline. The opt-out movement has led to changes in state and local testing policies in other states like New York. It can work here, too. How can I opt out my child? Many parents’ opt-out letters are honored, but just in case, you may also want to send your child to school with a note to read to the test proctor, something like this: “My parent told me not to take this test.” Or print that message on a sticker your child can wear on clothing. A 2017 memo from former Acting Education Commissioner Jeff Wulfson says, “Students should not be forced to take the test against their will.” A 2016 memo said, “We ask principals and test proctors to handle refusals with sensitivity. 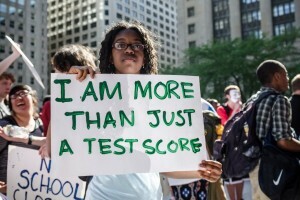 Students should not be pressured to take the test, nor should they be punished for not taking the test.” See http://bit.ly/refusethetest. Although the acting commissioner did not repeat the 2016 statement in his 2017 testing instructions, DESE has not rescinded the 2016 policy, which is common sense. It would be very unusual for a school official to berate or threaten a student for following a parent’s written instructions. What will my child do while the tests are administered? State officials have told schools that if a student refuses the test, they should be allowed to read or do homework. In some districts, the policy is that students must sit in front of their computers for 15 minutes, but if they have not started taking the test by then, they can read. At least one district (Somerville) specifies that the test proctor should tell the student that the proctor knows the student is not going to take the test, and that the proctor should not encourage the student to take the test. Will opting out affect my child’s academic standing? Passing the state high school tests is a requirement for a high school diploma. But there is no state penalty for students who opt out in grades 3 – 8. Some schools use the scores in choosing students for advanced work, but most do not. Check whether your school does. Email lesstestingmorelearning@gmail.com if you have questions. Will opting out cause my student’s school to lose federal or state funding? No. Parents have been told this, but it has never happened and there is no reason to think it will. The federal government has never required financial penalties. New York State has had at least 20% of its students opting out for the past two years, and despite some federal bluster, no New York school lost any money. Massachusetts officials have never said they would cut district or school funding. Will my school be hurt in other ways? A school’s state rating can be affected if participation of any subgroup of students, such as a racial subgroup, drops below 95 percent. But no school has ever suffered state takeover or intervention because of low participation and there is no state law that would permit such action even if state officials wanted to. How can I make my action have real impact? One parent quietly opting out will not stop high-stakes testing. It’s important to join with other parents and let people know what you are doing and why. This creates more political power and also makes it less likely that individual families or students will be criticized. Tell your newspaper, parent organizations, school committee, and legislators. Use parent email networks. Reach out to Citizens for Public Schools at lesstestingmorelearning@gmail.com to let us know what your plans are, and if you would like our support. Citizensforpublicschools.org links to more materials about opting out and the Less Testing, More Learning campaign. Please keep us informed of what you are doing. Email lesstestingmorelearning@gmail.com. We will not release any information without permission. For a model opt-out letter sent by Ricardo Rosa, click here. And for another approach, click here. If you decide to opt your student out of the tests, please let us know. Email lesstestingmorelearning@gmail.com. We will not use your name or any other identifying information without your permission. Sign the Massachusetts Less Testing, More Learning online petition at bit.ly/lesstest. “Like” the Less Testing, More Learning MA Facebook page, bit.ly/lesstestfacebook. Write to your local newspaper explaining why you feel high-stakes testing is harmful to our children. Email lesstestingmorelearning@gmail.com if you would like to get more involved in the campaign. See another excellent Opt-Out Toolkit from the Massachusetts Teachers Association, here. For more information on the national opt out movement, see http://www.fairtest.org/get-involved/opting-out. * Click here for a PDF of the Opt Out Fact Sheet.